Over the past year we began a journey of embracing agility at Brolink. We shared a few articles which included: “Lead the army of the future change from the front” and “Innovation requires agility“ . Our Executive head: Risk & Project, Hendrik Heyns mentioned that innovation is more than just having an idea, but is also about implementing that idea. Living up to this statement, the IT team started on the journey of adopting AGILE principles for software development in their department. That’s correct, IT has gone AGILE. What is AGILE: Agile is an approach to software development under which requirements and solutions evolve through the collaborative effort of self-organizing and cross-functional teams and their customer/end user. Time-to-market – Delivering the desired end result faster by means of keeping the customer closely-engaged with the project as it progresses to ensure that what you’re developing really meets their needs. Reduced costs – Another big factor is reduced costs associated with reducing unnecessary overhead in projects. Team empowerment – Improved employee productivity and morale that results from more empowered teams as well as Improved organizational synergy that results from higher levels of collaboration, trust, and shared responsibility within the organization. With the ever-changing world of emerging technology we are required to be more adaptable in order to survive. Gone are the days of green screens, grey walls, dull moments and not knowing what IT does. As part of our AGILE transformation, we have restructured, revamped and re-energized our workplace. 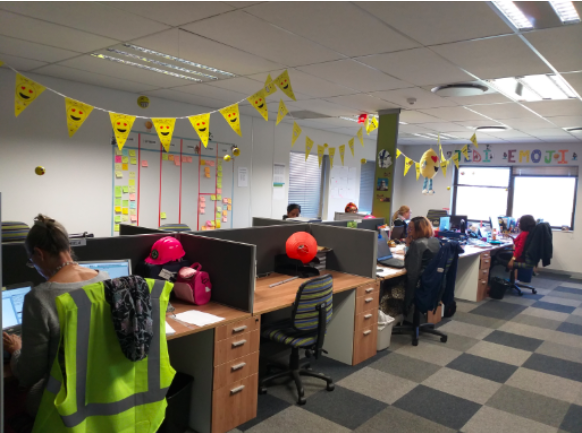 As illustrated in the images we have put up stickers all over our workspace, as this allows us to illustrate and keep track of our work logs and progress and allows everyone to be a part of our journey. Our highest priority is to satisfy the customer through early and continuous delivery of valuable software, therefore we have gone and organised ourselves into various different client PODS (small custom agile focused teams, ranging from four to eight members, responsible for a single task, requirement, or part of the backlog), allowing us to provide dedicated professional services to our clients. To get the excitement going, the teams have had some fun deciding on names for their PODs. Many have gone with names of superheroes, others were inspired by marvel movies, such as the Avengers and others went with The Croods. Although this project is aimed at putting our clients first, it also puts our staff first. It is a way of empowering them by giving them authority, responsibility and information. Helping them to experiment, and learn new ideas and concepts, while allowing us to recognise both team and individual effort. We have found that people, when engaged and empowered, deliver beyond what they even think possible. 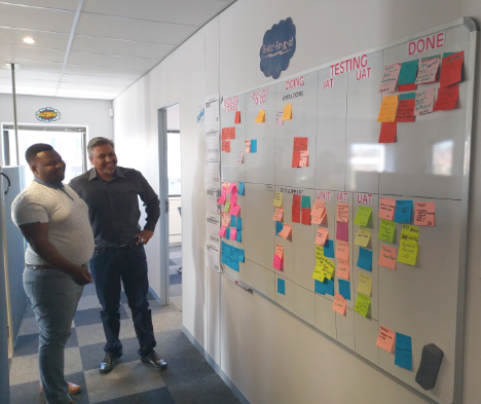 Each POD consists of a business support person, multiple developers, testers, setup admin, business analyst and a scrum master – a facilitator for the agile development team. Though we understand that good things take time, this is a journey and process that will be defined as we go along, but the team are embracing it and we can’t wait to see the positive effect it will have on our clients. As presented in the images we have put up stickers all over our workspace, as this allows us to illustrate and keep track of our work logs and progress.